A negative correlation means that there is an inverse relationship between two variables - when one variable decreases, the other increases. The vice versa is a negative correlation too, in which one variable increases and the other decreases. These correlations are studied in statistics as a means of determining the relationship between two variables. A student who has many absences has a decrease in grades. As weather gets colder, air conditioning costs decrease. If a train increases speed, the length of time to get to the final point decreases. If a chicken increases in age, the amount of eggs it produces decreases. If the sun shines more, a house with solar panels requires less use of other electricity. If it is darker outside, more light is needed inside. If a car decreases speed, travel time to a destination increases. If a car tire has more air, the car may use less gas per mile. The warmer it is outside, the fewer layers of clothing one has to wear to be warm. As one exercises more, his body weight becomes less. 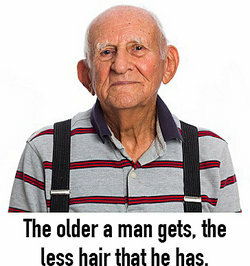 The older a man gets, the less hair that he has. The more one works, the less free time one has. As a tadpole gets older, its tail gets smaller. The further one runs, the slower one's pace may be. As the temperature increases, fewer hot chocolate products are sold. As more employees are laid off, satisfaction among remaining employees decreases. As the temperature decreases, more heaters are purchased. As a bikers speed increases, his time to get to the finish line decreases. As the slope of a hill increases, the amount of speed a walker reaches may decrease. The more one eats, the less hunger one will have. As humidity increases, people's desire to be outside may decrease. As snowfall totals increase, the amount of people driving decreases. As one increases in age, often one's agility decreases. If the temperatures outside decrease dramatically, heating bills will increase. If a resident uses more mouse traps in the home, the amount of mice in the home will likely decrease. The more alcohol one consumes, the less judgment one has. The more a window is obstructed by curtains, the less light that will enter the house. The more one cleans the house, the less likely there are to be pest problems. The more one works out at the gym, the less body fat one may have. The more one smokes cigarettes, the fewer years she will have to live. The more one runs, the less likely one is to have cardiovascular problems. The more vitamins one takes, the less likely one is to have a deficiency. The more iron an anemic person consumes, the less tired one may be. Not every change gives a positive result. These different examples of negative correlation show how many things in the real world react inversely. "Negative Correlation Examples." YourDictionary, n.d. Web. 23 April 2019. <https://examples.yourdictionary.com/negative-correlation-examples.html>.